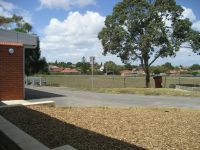 As an inner-suburban school, Reservoir West Primary School is very fortunate to have an extensive grassed area at the southern end of the school which is known as the ‘oval’ (even though it is square in shape). The oval includes AFL goalposts at opposing corners, a north-south cricket pitch and soccer goals oriented across the square. A large sandpit and a smaller jumping pit are also found in this area. A double set of cricket nets are also located in the south-west corner. A synthetic turf Tee-Ball/Softball diamond is serviced by fixed team seating in the north-west corner and another synthetic turf area in front of the gazebo provides a rounders diamond for inter-school sport. Our assembly area consists of a large stage for performances and assemblies as well as four bat tennis courts covered by a 30m by 20m canopy. 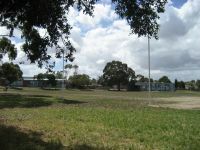 Our basketball court area is an extensive synthetic turf area which provides a two full-sized basketball/netball courts with reversible towers and a volleyball court. One whole court is covered by one of our canopies.